We’ve been in India for a little over two weeks now and it has already been quite an adventure. The volunteering is going pretty well. We had a couple bad days, but that was for two silly reasons. We were taking everything way too seriously, and every time I’d build a tower with the blocks, a kid would knock it down and laugh at me. We had to tone it all the way down, and we’ve been having fun ever since. Being the only white people in town in India has been a different experience than it was in Ecuador. In Ecuador everybody was really nice and wanted to be friends. In India we’ve been getting a lot of dirty looks. Everybody also stares at Liza to the point that she doesn’t even want to go out. In Ecuador the creepy men would ask the white women to go dancing or something. Here the men look at women like you’d look at a piece of used furniture on somebody’s lawn with a sign that says “Free” on it. We’re hoping it gets better after we leave the program and go to the tourist attractions where the people will hopefully be more accustomed and hopefully more respectful towards western women. Palampur, the town we’re in, is a legitimate Indian city. There is no tourism so there is no phony culture or gaudy attractions or anything. It’s definitely the real India. If we left today we might not have seen much, but we’ve definitely experienced India. This weekend, though, we did our first sightseeing. It’s actually the first time we’ve seen any tourists in the two weeks we’ve been in India! 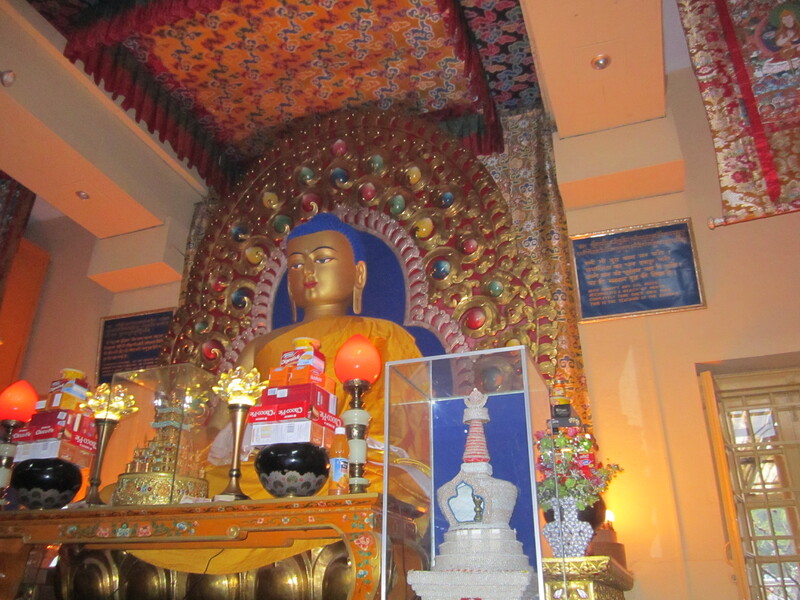 We went to Mcleod Ganj in the city of Dharamsala. It’s where the Dalai Lama lives in exile. It’s a much different vibe than Palampur. Most people are Tibetan and/or monks so there is much less staring here. We visited the Dalai Lama’s Temple. Also, as I may or may not have mentioned our host family is vegetarian and doesn’t have a shower so this weekend has been the first time in two weeks I’ve taken a real shower and eaten meat. I’m not sure which I’m happier about! I’ve also begun my souvenir shopping. One bad thing that’s happened this weekend is that someone… Not me… Okay it was me… Set down our guide book in a shop and forgot it there. Fortunately we were able to download the same guide book on Liza’s iPad! When you were visiting the temple did you have the urge to start singing…..”well hello Dolly”. Sorry, it just had to be said. Granpa.